Wondering what the biggest trends in kitchen design are? Look no further. Keeping up with kitchen design trends can be a daunting task, but if you do, you are left with a rewarding feeling of revitalization as you enter into the modern age of kitchen design. If you know you want to undergo a few changes in your kitchen design but don’t know what is currently trending, look no further because these are several of the biggest trends in kitchen design. Many kitchens feature a white or light paint on their walls, and often many of their appliances and cabinets as well. This is why an increasing trend in kitchen design is adding darker colors to contrast with the white in your kitchen design. This can be done by adding a darker colored floor to add some flavor to your kitchen design. Additionally, investing in black colored appliances is another good way to contrast the whiteness in your kitchen with darker colors. 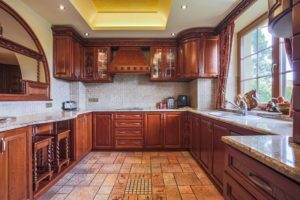 Sure, stainless steel looks nice but it also has a dominating, attention-seeking presence in a kitchen and will attract all eyes to it instead of complimenting the rest of your kitchen’s design. One kitchen design material that will seemingly never go out of style is granite. Using granite as a material to build your countertops out of will offer a classic and always popular look to your kitchen. Granite’s wide customization abilities offer a variety of colors, patterns, and appearances to allow it to fit in with whatever kitchen design plans you may have, making granite an always popular choice that you can never go wrong with picking. If you do not already have a range hood in your kitchen, now would be the time to invest in one. Not only is a range hood a useful appliance to have in your kitchen, but it is one that will never go out of style and will eventually add value to your home when you sell it. It is also the perfect appliance to customize and combine with some of the newest kitchen design trends, like metal sheeting. A range hood can attract a lot of attention in a kitchen with little upper cabinetry, so adding a metal sheeting around it will give your kitchen added flair. For more information regarding our products and services, please contact us or pay us a visit! Our Millersville and Edgewater locations are open Monday-Friday from 6:30am-4:30pm and Saturday from 8am-1pm. To contact our Millersville store, call 410-987-5200. Our Edgewater location can be contacted at 410-956-0400. Also, feel free to follow us on Facebook and Twitter for more updates. This entry was posted on Friday, March 23rd, 2018 at 11:17 am. Both comments and pings are currently closed.